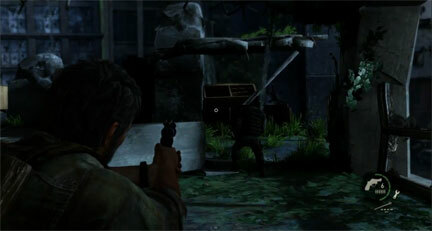 This is going to come across as sounding awful, but the Last of Us demo is quite disappointing. After being suckered into buying a sub-par God of War game (Ascension) under the premise of getting access to the Last of Us playable demo, I was quite unhappy about the "early access" notice instead. Then The Last of Us was pushed back from the original May 7th release date to June 14th. That wasn't so bad. I would rather wait for a good game than have it rushed and end up with another Aliens: Colonial Marines. But then the demo also got pushed back- ok, aggravating, but still not too bad. It pains me to say, but Naughty Dog made a huge mistake here. Not about the game, but about making us wait for the demo. It's BARELY 20 minutes long, and could've EASILY been released months ago. I cannot see a reason why we had to wait so long for such a pitifully short demo. Make no mistake the demo provides us with a very small taste of the what the game will offer in much larger doses, such as the swiftness with which you can die, and the time it takes to craft items or bandage a wound is experienced. By a small taste I mean, we are allowed to dab it on our outstretched tongue, but now allowed to chew. I expected more. Much more in fact. The game will certainly be wonderful, but now I have a slightly bitter taste left from unfulfilled demo anticipation. It just bothers me that it took, no kidding here, longer for me to download and install the demo than it did for me to complete it. Even when I was scrounging around looking for little hidden things. this blog. I am hoping to view the same high-grade blog posts by you in the future as well. Thank you for the comment! I'll swing by your page- So far it only has 2 awesome boats, but it's a start. Keep at it, it takes a bit of time but you'll build up quickly. Call of Duty: Ghosts- A 6 second Vine "preview." Star Trek Into Darkness: Not Quite a Review. Batman: Arkham Origins: First Trailer is up! EA Games stopping Online Passes! Amazing Spider-Man 2: Giamatti's Rhino pic. Borderlands 2: Krieg Available May 14th!